To make such statement by a young budding MP, people wonder start worndering. Media gagging was the main Reason for getting rid of previous regime . There is no sense telling it to media ,as they have got the cardinal rights to write . It is up to public to believe or not to believe . There are many sins committed by some people in the current current regime ,Why not expose them so that they are more careful? SHOOT the messenger is what happens everywhere in SL where people are SUPPOSED to follow KALAMA SUTRA. This DISGUSTING filthy talking minister is a DISGRACE. 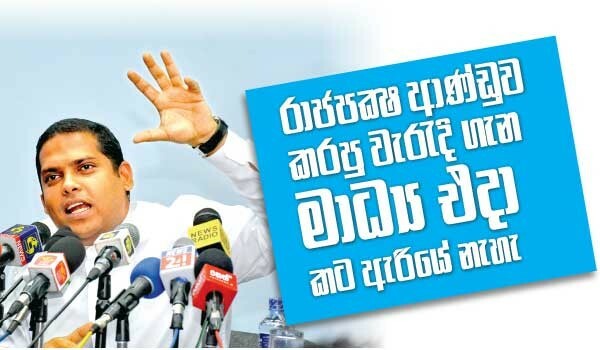 And what MESSAGES were you sending during the last Presidential and General election campaigns dancing the JIG propagating false stories that demonized the MR/UPFA GOSL? Now you are BACK IN FORM, shgedding CROCODILE TEARS about the Yamapalanaya! Come ON … Give us a BREAK! Bloody HYPOCRITE of an EELAMIST agitator, trying to PONTIFICATE passing JUDGMENT on others, mired NECK DEEP in the mud of TREACHERY and BACKSTABBING himself! SHOOO ….. BUGGER OFF Katussa (Lorenzo) … CRAWL back INTO YOUR EELAM HOLE!! It was not just the local media the media in the West did the same. It is the Indian Empire behind all these.